After withdrawing from the INF Treaty, the United States will have the right to develop and deploy missiles at its bases in Asia. 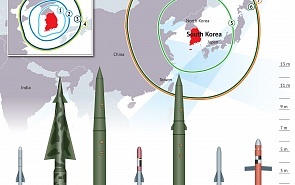 China, Taiwan, Japan, North Korea and South Korea are also stepping up the development and deployment of cruise and ballistic missiles with a range of hundreds and thousands of kilometers. Some are able to carry nuclear warheads. The infographics is timed to the 9th Asian Regional Conference of the Valdai Club.